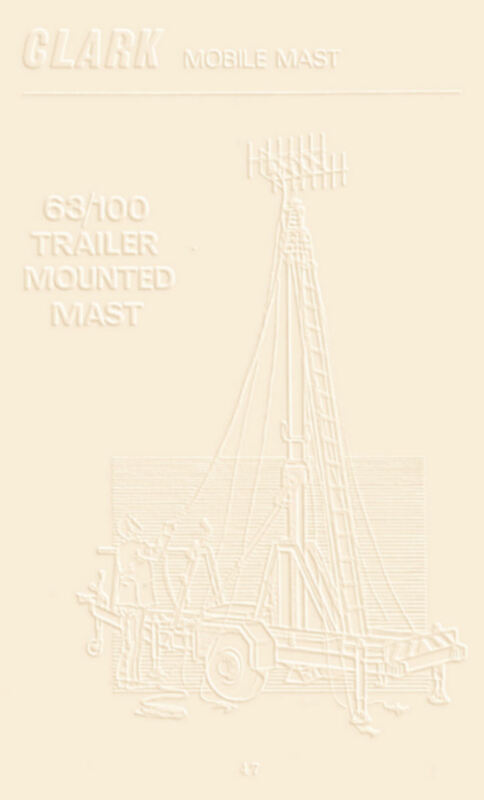 Illustrated in this web page, for historical purposes, is the Surveyor Field Mounted Mast page from Clark Masts early 1970's catalogue. The Surveyor Field Mounted mast is still available today and can be seen here. The Clark Masts Surveyor Field Mounted mast of the late 1960's - early 1970's was designed to take light to medium duty loads, being a unique mast based on their PT mast series. 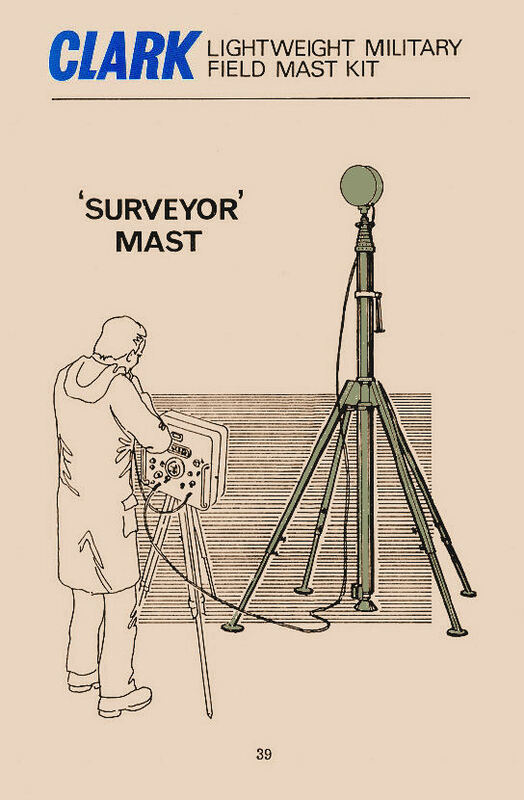 The Surveyor was a designed to lift geophysical equipment, the likes of which is used in the surveying field. Like all other PT Series masts the Surveyor's mast sections were keyed to prevent inter-section rotation, making it suitable for use with directional headloads. The Surveyor's extended height was 15 metres using 7 sections which provided a retracted height of 3 metres. 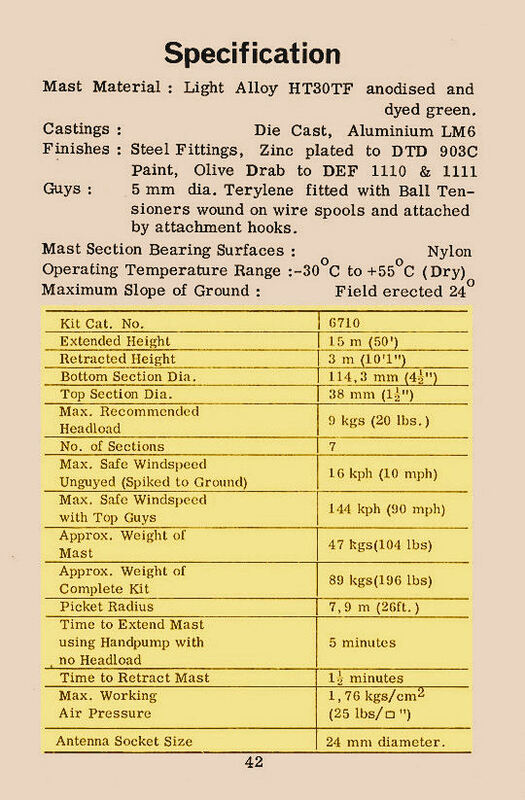 Like all PT Series masts, the Surveyor's base tube diameter was 114.3 mm (4.5") and the mast had a headload capability of 9 Kg. A Handpump was supplied for mast extension/retraction. 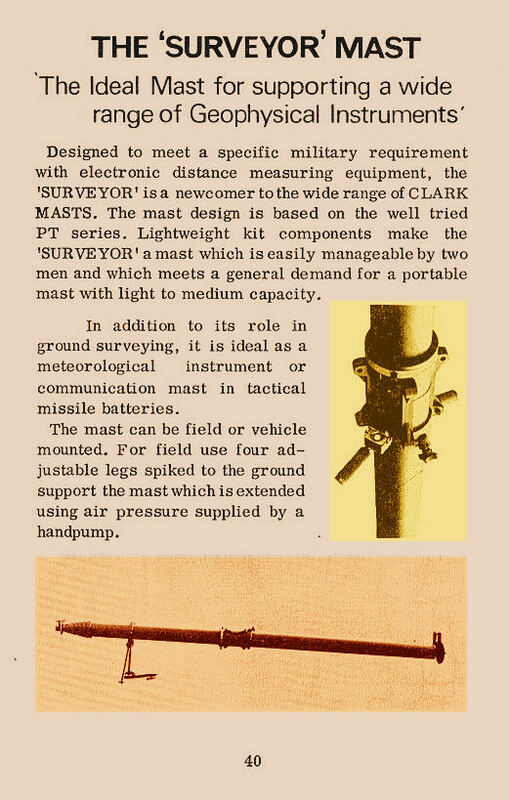 The Clark Masts Surveyor Field Mast Kit was supplied with all the components necessary for a portable field mounted mast. 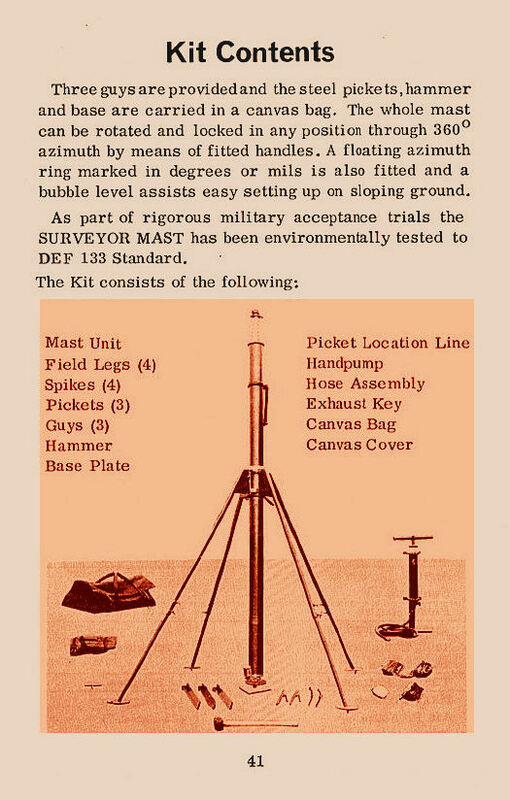 These included an attached folding leg Tripod, Guy Assemblies, Guy Stakes, Guy Stake Hammer, Guy Stake Location Line, Base Plate, Base Plate Spikes, Handpump, Mast, Weather Cover and an Accessory Carrying Bag. The total weight of the Surveyor mast with it's attached legs was 47 Kg while the entire mast kit weight was 89 Kg. A deployed Surveyor mast had a wind speed rating, with 1000 square cm sail area on top into wind, of 16 km/hr un-guyed and 144 km/hr when guyed. The specified time taken to extend the mast with it's handpump was 5 minutes.